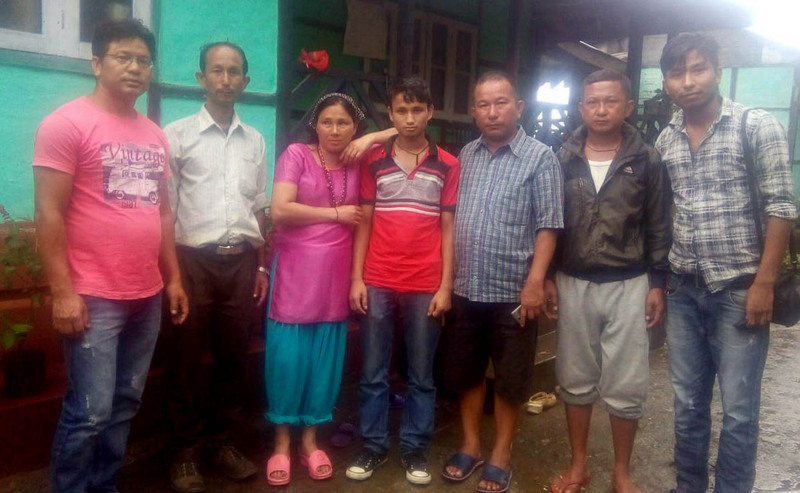 Social media Face book help to unite a 40-year-old woman with her family almost after a month after she lost her way from a Mirik tea garden. Kamala Chhetri went missing from Singbulli tea garden under Mirik Block on July 7. 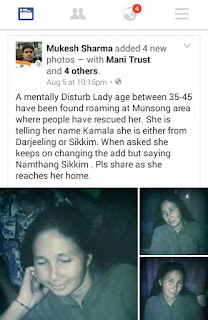 She was tracked, identified and united with her family at Munsong in Algarah Block Kalimpong yesterday .Kamala Mentally disturbed lady had been staying in the tea garden with her husband Nagendra Chhetri and her son Niraj Chhetri . Last month, she lost her way when she went to market with little money with her. Her family lodged a police complaint at Mirik Police Station but she was found untraced. Meanwhile a lady about 40 years was seen roaming at graveyard side at Munsong few days ago after which a local social worker Suren Blone bought the lady to her home. 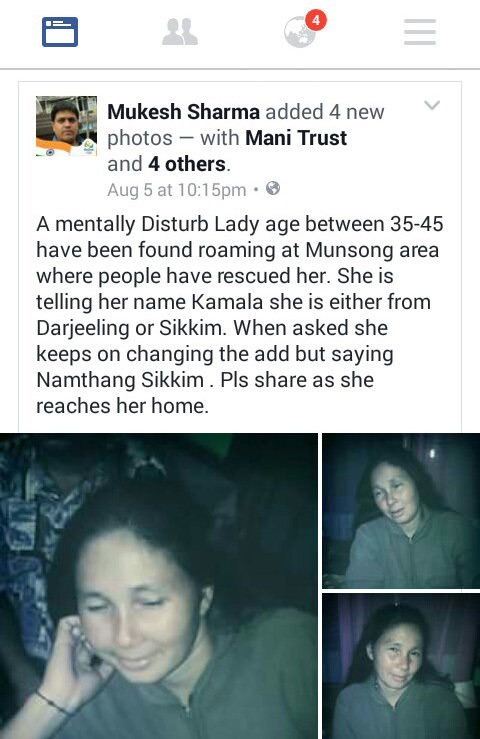 The news of the unknown lady found was shared by a local tv journalist Bipal Rasaily to Kalimpong based Journalist Mukesh Sharma who got the pix in his whatsapp from Ongdup Lepcha a student from Munsong. He uploaded the detail and pix of the lady in his face book profile and later share the information with a some social news site of Darjeeling and Sikkim. The post was shared by Darjeeling Chronicle at around 11 pm. The Darjeeling Chronicle page lists news and events and it has multiple administrators not only from Darjeeling, Calcutta, Mumbai and others cities of India but also from Canada, the Netherlands and the United States. The page has more than 70,000 followers. One of the administrators, said: "We received the message from Mukesh Sharam on August 5 around 10.20 p.m and as soon as we put it up, it was shared 64 times. It seems that Naren Thapa Basically from mirik but currently working in Israel informed about the where about of the lady in DC page and left a contact number of Binay Subba from the same village. The DC provided the number to Mukesh Sharma inbox at 6.52 am Saturday after which the he call subba who helped the news of missing reached the Chhetri home at Singbulli. Nagendra Chhetri husband of Kamala and his son Niraj Chhetri reached Munsong at 4pm and took Kamala to her sweet home. Nagendra informed that he searched her wife as he can but was untraced. He thanks all involved in the process of helping find her missing wife. 0 Respones to "Facebook helps find a 40 yr old woman who lost her way "